I participated in a campaign on behalf of Mom Central Consulting for Heluva Good! I received a product sample to facilitate my review and a promotional item as a thank you for participating. My children started back to school last week and for the first 2 days I told them they had to buy their lunch. This helps them get adjusted to the new routine while everyone is still a bit new to the process. The children were less than pleased when they came home from school. I heard all about how horrid the school lunch was. They only gave them 4 mini corn dogs (complains the 6 foot 13 year old boy). The milk tastes gross (announces the 11 year old girl child). How do you mess up MILK? I’m sure the school lunch program is providing exactly the nutrition that the federal government says my children need but if the kids don’t like the taste of it, I am not wasting my money! Now that they understand the lunchroom process, we are back to packing our own lunches and the kids are much happier. I can get creative with their lunches when I pack them myself and manage to find a way to balance the nutrition I know that they need with the flavor and taste that they really enjoy. 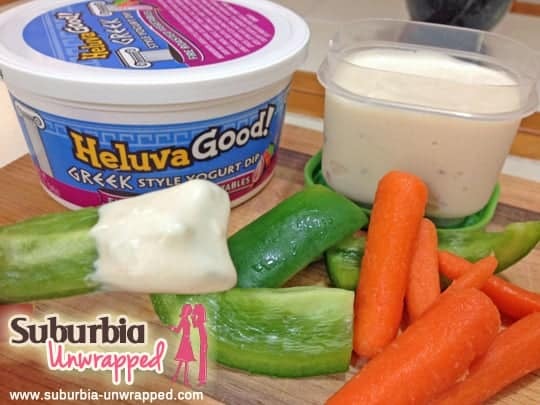 I was sent a selection of Heluva Good!Greek Style Yogurt Dips to try out and over the last couple of weeks this stuff has gone on just about everything. I received four flavors, including French Onion, Herb Ranch, Southwestern Chipotle, and Fire Roasted Vegetables. I have tried the regular Heluva Good! Dips before but never the Greek Style Yogurt Dips so I was curious to see how they tasted. I was very pleased! The texture is very creamy and the bold flavors go well with a lot of different snacking and meal options. Of course, our favorite way to enjoy just about any dip is on some sort of chip. We tried the French Onion dip with some corn chips and really enjoyed the flavor. The Herb Ranch got added to some baked potatoes instead of sour cream (a LOT more flavor! ), and the Fire Roasted Vegetable is a great accompaniment to carrot sticks in the lunch box. My son is a dipper….he will eat just about anything if you give him something to dip it in! What better way to get him to eat carrots and bell peppers but to give him a container of dip to go with it? 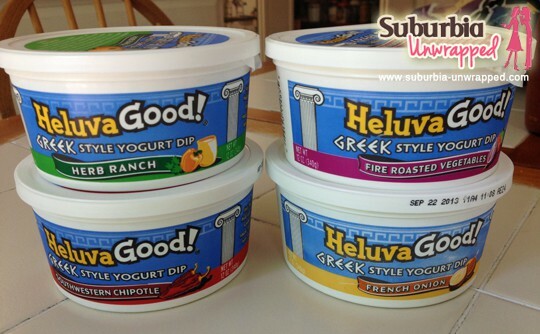 Heluva Good Dips for Tastier Snacking! If you are looking for a new way to add a bit of zip to your snacking routine I was very happy with the flavor and texture of Heluva Good! Greek Yogurt Style Dip. 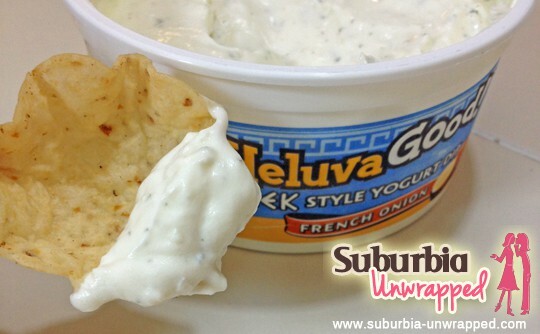 It is a great way to add flavor to your snacking routine without all the guilt that comes with traditional dips. If you want to learn more about them you can “Like” Heluva Good on Facebook and follow on Twitter! Oh yum! I haven't seen the Greek style dip yet. I need to find this!